Stock photo of the detail of the Seville Cathedral and La Giralda at sunset, a UNESCO World Heritage Site, Santa Cruz District, City of Sevilla, Province of Sevilla, Andalusia, Spain. This view of the Seville cathedral and the bell tower shows a lot of detailed stone construction. 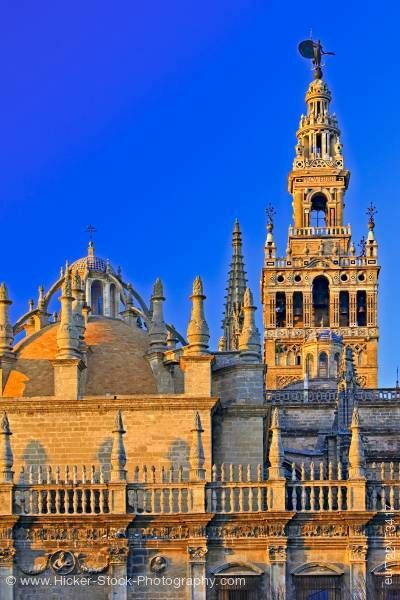 This stock photo shows Seville Cathedral and La Giralda, a UNESCO World Heritage Site, Santa Cruz District, City of Sevilla, Province of Sevilla, Andalusia, Spain. This view of the cathedral and the bell tower shows a lot of ornate stone construction. Pediments above the windows, pilasters on either side, along with medallions and detailed fascia are shown on the lower section. Another section of the roof has plain fascia with columns above and pinnacles on each. Behind the pinnacles is a dome with a tower above has archways, flying buttresses and a finial on top. The tower with its columns, archways each corner with a finial, leading to a smaller bell tower with its balustrade, archways and columns. On top of the circular tower is the bronze statue. Seville Cathedral and La Giralda (bell tower/minaret), a UNESCO World Heritage Site, seen from Plaza del Triunfo at Sunset, Santa Cruz District, City of Sevilla (Seville), Province of Sevilla, Andalusia (Andalucia), Spain, Europe.